IT organizations always strive to adapt to constant changes within technology and business requirements. These changes make it difficult to find an optimal structure that will consistently and effectively deliver and support the strategic direction of the business. No sooner is a structure established than a new technology is introduced or business and regulatory requirements changed, rendering the organizational design obsolete or in need of reconfiguration. The challenge for IT management is that it can never find a full rest state for its IT organization and constantly needs to reevaluate its structure. Organizational structure changes also require a vast amount of change management effort, which is costly and time-consuming. This blog examines these dynamics and will propose some suggestions for improvement. 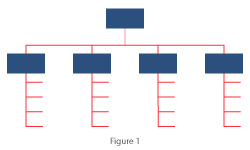 Most IT organizations apply a very hierarchical organizational structure. This structure can be described as basic departmental, where the groupings are determined by IT functional categories. There is the PMO office, security, networks, business relationship management, databases, application operations, and project delivery. Figure 1 depicts such a structure graphically. The fundamental problem with this organizational structure is that it does not lend itself well to supporting a strategic plan in delivering value. The reason for this is that hierarchies are top-down driven, and any given strategy will be disseminated across the functional disciplines of the organizational structure. Therefore, a strategic plan delivered from the executive level will only be adopted to the extent of the functional scope within an IT department. Another disadvantage of these hierarchical structures are functional silos. Silos always inhibit communication and teamwork and foster a territorial perspective. One approach to counteracting these disadvantages is the introduction of cross-functional teams. Since this is a multi-disciplinary approach, it helps to minimize silos. COEs (Centers of Excellence) are such attempts to bring different IT disciplines together under one management to be able to respond more quickly to arising issues. Operating core responsible for executing the value chain. Mintzberg recognizes the critical element of defining the operating core as the collection of primary processes that generate the value for the organization. Therefore, we can take his model and develop a generic structure for IT, which is demonstrated in Figure 2. The fundamental difference between this structure and any form of a hierarchical structure is that the focus of this structure is clearly on the value-generating processes within IT. The value-generating processes are grouped in delivery and operations which leads directly towards developing a DevOps environment. DevOps’ fundamental notion is “the use and implementation of practices intended to reduce the time between committing a change to a system and the change being placed into normal production while ensuring high quality” (Bass, Weber, & Zhu, 2015, Location No. 315). Therefore, the primary focus of IT is to improve this production process and, through these improvements, become a strategic partner with the business. 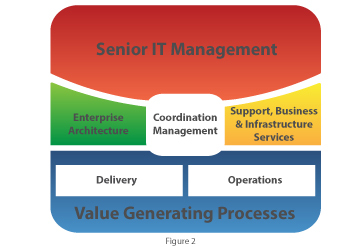 All other functions within an IT organization are there to support the value chain processes. Enterprise architecture plays a significant technical role: it continuously assesses the production process from a technical perspective to find methods of improvement and determine new technologies for new core processes that can be integrated or added to the overall production flow. 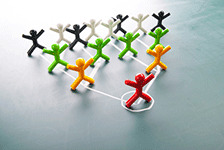 The term coordination management was used to highlight the position of middle managers, who coordinate between support functions and technical functions with the prime objective of improving the production process. With this structure, the focus has changed from a departmental perspective to a common IT strategic objective where every member of an IT organization is contributing. Bass, L., Weber, I., & Zhu, L. (2015). "DevOps: A Software architect’s perspective" [Kindle 5.8 version]. Retrieved from Amazon.com. Mintzberg, H. (1979). "The structuring of organizations" Upper Saddle River, NJ: Prentice Hall.